Wesley Newcomb Hohfeld, born in 1879, died prematurely in 1918. He left only a few law journal articles as his published work. His 'Fundamental Legal Conceptions', originally published as two articles in the 'Yale Law Journal' for 1913 and 1917 and left incompletely revised at his death is, however, one of the principal foundations of analytic jurisprudence. 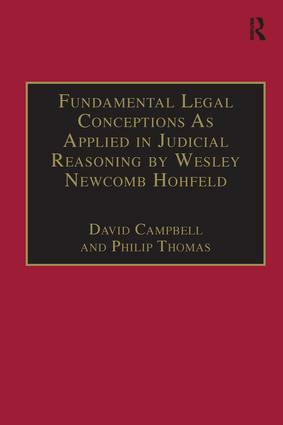 The analysis of rights that Hohfeld offers is still regularly cited and relied upon by both lawyers and philosophers, and it is treated as a source of insight into the nature of moral rights as well as the legal rights that were Hohfeld’s own focus of concern. Although some of his analytical distinctions were anticipated by earlier jurists, their insights were fragmentary and imperfect by comparison. Hohfeld’s systematic and exhaustive (yet concise) treatment is generally regarded as unsurpassed. This is not to say that he has not been criticized, but his book forms the essential starting point for any discussion of the nature and structure of rights. 'Fundamental Legal Conceptions' has long been difficult to obtain. This new edition makes this classic of analytic jurisprudence available with a comprehensive introduction by Dr. N.E. Simmonds of Corpus Christi, University of Cambridge, UK. Contents: Introduction by Nigel E. Simmonds; Fundamental legal conceptions; Section 1; Section 2; Notes.